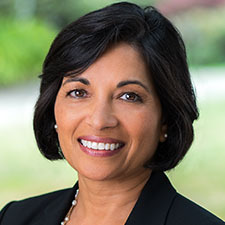 Sunita Mutha is director of Healthforce Center, a professor of clinical medicine and internist at the University of California, San Francisco. With more than 20 years of experience as a physician and health researcher, she brings a deep knowledge of the health care landscape and a passion for preparing leaders to improve health in their communities and beyond. Mutha graduated from Albany Medical College, completed her residency and chief residency at the University of Pittsburg Medical Center, and completed a fellowship in the Robert Wood Johnson Clinical Scholars Program at Stanford University.